Get top-quality embroidery work tailored to your individual needs from the professionals at Frontera Embroidery LP. With more than 6 years of industry experience, our locally owned and operated company offers a great selection of embroidered sportswear, western wear, and equestrian products such as saddle blankets, lead ropes, and halters. Our sought-after, 1-piece halters are never welded, made from durable nylon, and can be personalized with a wide range of colors. Frontera Halters are fully guarenteed for five years. 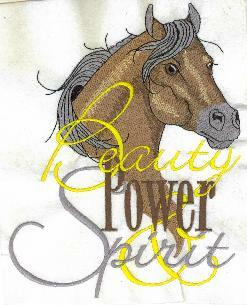 Call our embroidery company to have your horse products embroidered. 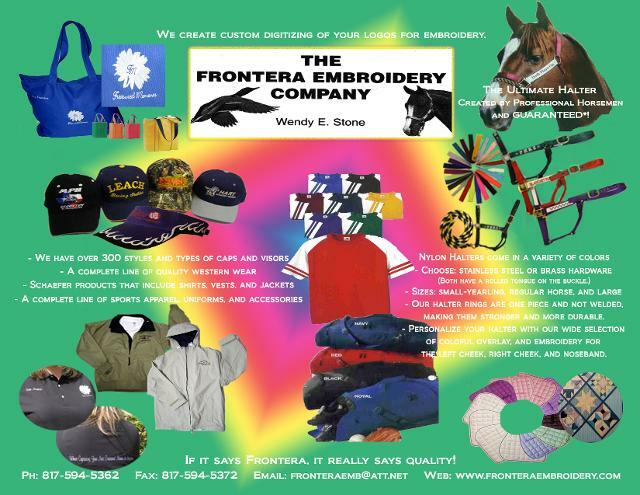 As an official sponsor and proud member of the Texas Quarter Horse Association (TQHA), Frontera Embroidery LP is proud to offer a wide range of strong, long-lasting equipment and embroidery. Whether you're interested in custom embroidered logos, one-of-a-kind western wear, or colorful saddle blankets, we're the only name you need to know for superior craftsmanship at an affordable price. 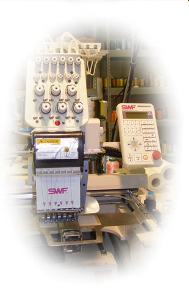 Contact us today, and experience everything your embroidery company can be. including caps, western wear, saddle blankets, halters and much more.